There are close to 100 cucumber varieties, but we are most familiar with slicing, pickling, and English cucumbers. These three types differ in size, appearance, taste, and texture. Of the three, the English cucumber is favored by many for several reasons. English cucumbers, Cucumis sativus, were actually bred to create a cucumber without some of the more undesirable characteristics that this vegetable has, such as a tough outer skin, large seeds, and a bitter taste. 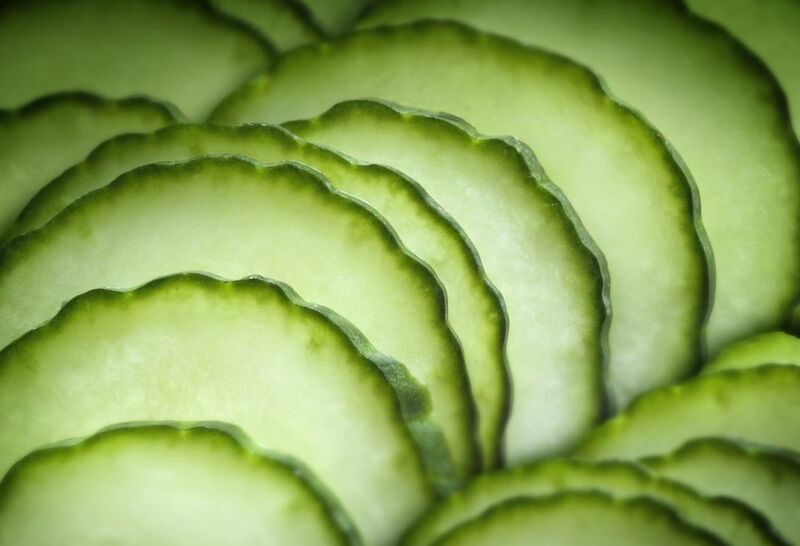 They are also known as hothouse cucumber, burpless cucumber, seedless cucumber, and European cucumber. The English cucumber is long, thin, and straight. It can be twice the length of a regular slicing cucumber; a typical English cucumber is around 14 inches long. The skin is dark green and smooth (meaning without any bumps found on pickling cucumbers) with ridges running the length of the vegetable. The interior is a light green studded with very tiny seeds in the center. Because the skin is delicate and easily torn or nicked, which opens the door for mold, it will almost always be packaged in shrink wrap to protect it and extend the cucumber's shelf life. An English cucumber is generally sweeter than the regular, common cucumber which has many large seeds, contributing to their bitter flavor. The skin is thinner than a slicing cucumber and therefore doesn't need to be peeled. And because the seeds are very small and easy to eat and digest, the cucumber doesn't have to be seeded before enjoying—you can simply slice and serve. English cucumbers are sold year round and are usually more expensive than regular cucumbers. Many times they are labeled as "seedless cucumbers." They can be found in the produce section of your local grocer, usually sold in plastic wrap. Look for a cucumber that is evenly cylindrical, between 10 and 15 inches long and 1 to 2 inches in diameter. It will begin to decay at the ends first, so gently squeeze both ends of the cucumber to test for mushiness, and then run your hand along the entire vegetable to feel for any soft spots; the entire cucumber should be firm. It is best to avoid if the shrink wrap has come loose anywhere, especially if you see moisture or liquid inside the plastic. Store the English cucumber in its plastic wrapping in the refrigerator. It should stay fresh for about 1 week as long as it doesn't retain any moisture; you may want to avoid the humid vegetable drawer and place it in a drier spot in the fridge. When using just a portion of the cucumber, open one end and pull back the plastic, cut off the amount you need, and then rewrap the end with the excess plastic. Also be sure to only rinse the piece of cucumber you will be using. English cucumbers are preferred by most chefs over common cucumbers for their edible skin and seeds. This makes them easy to use and excellent for salads, raw side dishes, and even enjoyed on its own. They are perfect to use in cucumber tea sandwiches, in a creamy cucumber dip, and as part of a vegan spring roll. Of course, you can also simply slice or cut into "fingers" and add to the crudite platter, or as a sandwich topping, or to contribute crunch to tuna salad.